Part of the fun having big kids around all summer is creating new games for them to try out. The younger kids in my care see the big kids doing these things and try them out too. It's great for everyone involved. For Friday's activity I created an obstacle course with kiddie pools in the backyard. 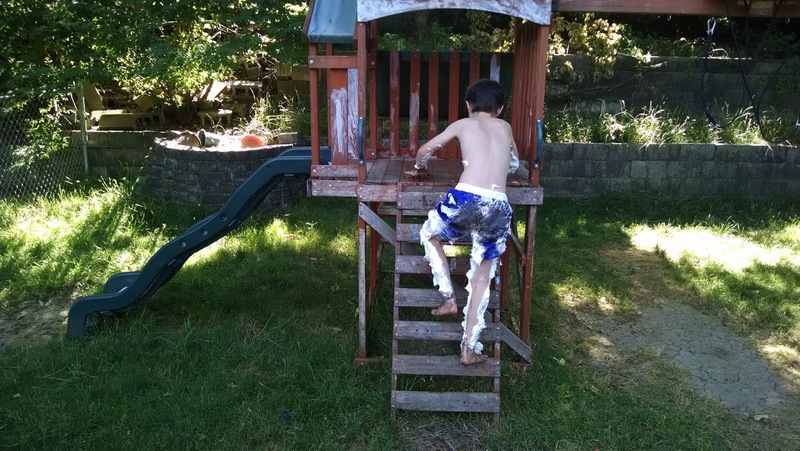 We've done obstacle courses before (the shaving cream slide is popular among all of the kids. Read more here). This time we did it a bit differently. 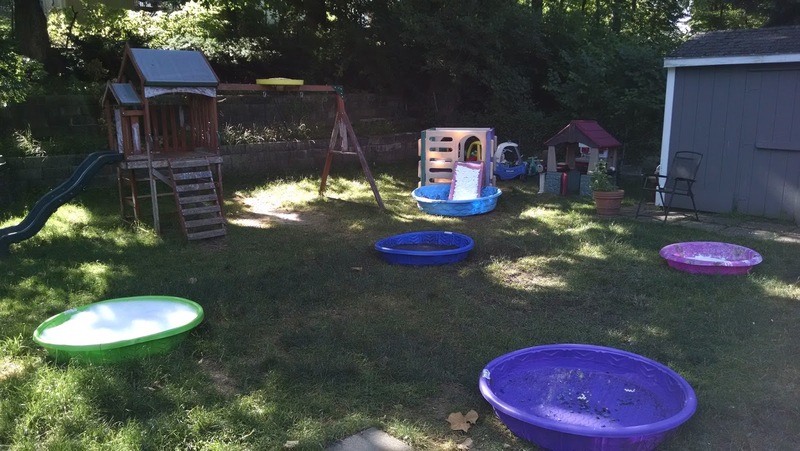 I set up a starting line and then had the kids go through each pool, completing a challenge in each pool, climb, and slide, finally running to the finish line, all while I timed them. The child with the fastest score at the end won. 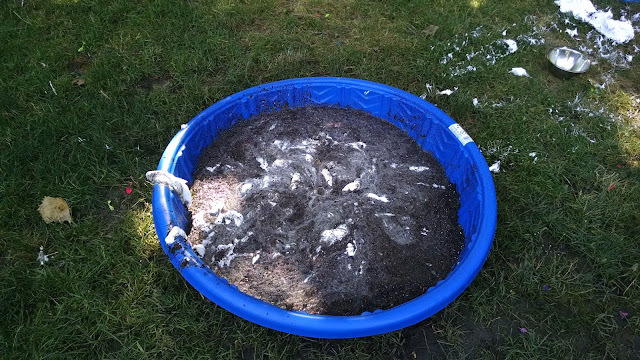 The Goop pool (5 boxes of cornstarch + water). 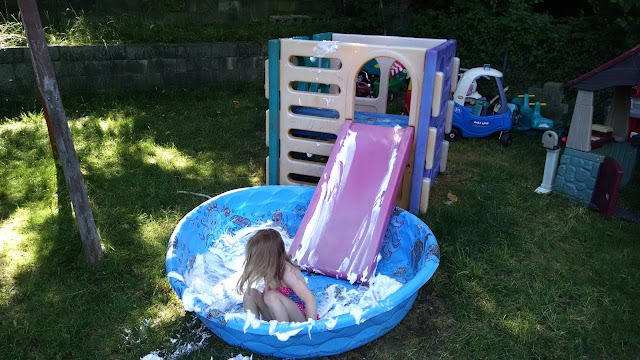 Shaving cream slide/pool. The slide can get extremely slick once it's used a few times....which is why the kids love it so much! I put 25 pennies at the bottom of the pool before spraying the shaving cream on top. The mud pool. I put 30 pennies in the mud for the kids to find and we couldn't find a single one! Next time I'll stick to hiding bigger toys (Hot Wheels or Little People seem like good choices) in the mud instead of something so small. The bubble pool (Dawn dish soap and water. Spray the hose hard to create the most bubbles). 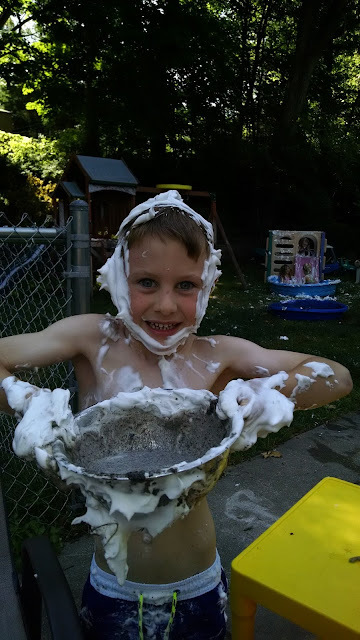 This was great for washing the shaving cream and mud off of legs and arms. The last pool: the marble pool. The kids had to pick up three marbles (not at the same time) with their toes and drop them onto the ground before running to the finish line. This was a surprise hit with all of the big kids. After the course was finished by everyone, several of the big kids spent an hour or more picking up the marbles with their toes, putting them back in the pool, and doing it again and again. Kids younger than five either had a hard time picking them up with their toes, couldn't do it (and just picked them up with their hands), or didn't even try it. This was definitely a pool just for the older kids. 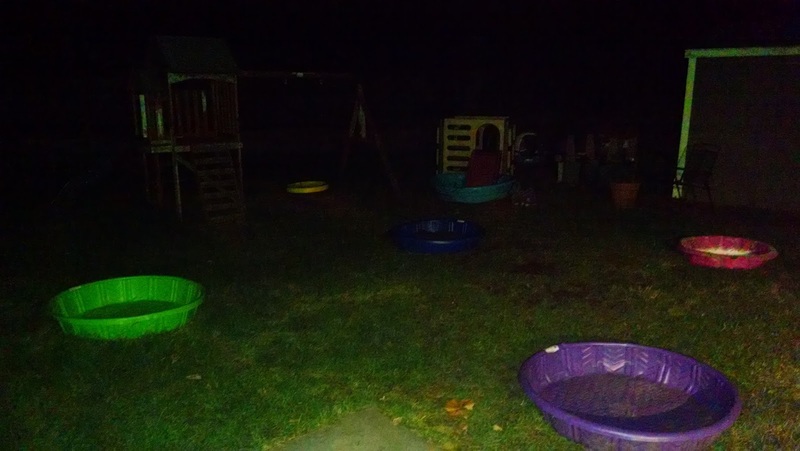 I set a few pools up the night before. The goop and mud pools were easy to create the night before. The bubble, marble, and shaving cream pools had to be done the morning of (right before playing). The obstacle course was simple: begin at the starting line and run to the goop pool. Sit down and stand back up (this can get tricky because the goop is sticky and hard to move in), then climb the Cube climber and slide into the shaving cream slide. 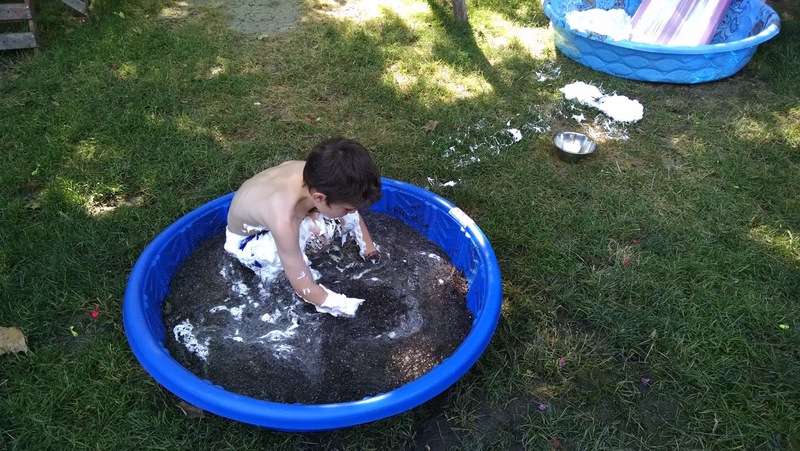 Find one penny in the shaving cream, drop it into the bowl (that was between the shaving cream and mud pools) and make your way to the mud pool. Originally the object of the mud pool was to find a penny but it was too hard, so it became sit all the way down in the mud before popping back up and heading to the tree house. 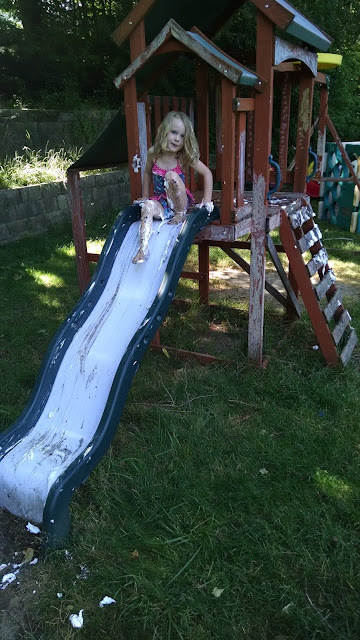 Once at the tree house, the kids had to climb the ladder and go down the slide (after the first couple of kids went down, the slide got incredibly slick and needed to be wiped off so one slid into the fence). Then to the bubble pool for a quick rinse off. The last pool was the marble pool, where kids had to pick up three marbles (at different times or the same time, whichever they could do, just three marble total) and finally run to the finish line. Most of the kids finished the course in 2 minutes or under. The winner did it in a minute and half. The younger the child the longer it took (I had to repeatedly remind them that quickness mattered). The kids informed me that the mud pool "looks like delicious cookies and cream!" After everyone who wanted to do the course had a turn (the kids two and younger didn't want to do the obstacle course), I let the kids loose. They were able to play however they wanted to in each of the pools. 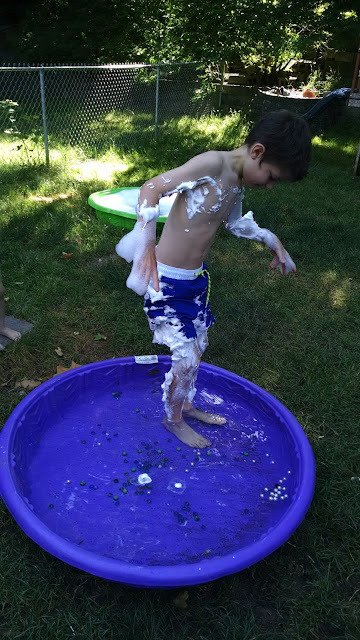 That's when the little kids experimented in each of the pools and had a blast giving the shaving cream slide a try and even throwing the goop a bit. Our kiddie pool obstacle course not only kept the kids busy, active, and moving, but it held everyone's interest. The kids cheered each other on when it wasn't their turn, the younger ones loved watching the big kids which helped them when trying out the different pools, and the kids were more than thrilled to play in each pool all morning long. The kiddie pool obstacle course was great for challenging kids of all ages and keeping them entertained on a hot summer day. 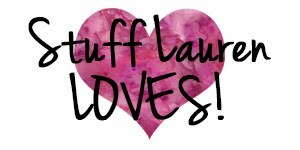 This was loved so much that the kids has requested to do again later this summer.